Canon believes that the camera market will contract by half, over the next two years, but Fujifilm believes it could grow given the right innovations. The Asian market is huge so some markets might grow a lot while others contract, especially China where many don’t own a digital camera yet. Fujifilm thinks that full-frame is probably one-third of the market by value. Their recent financial results show around 10% growth for them in the camera market. The X-H line will continue on and it is not just about IBIS, but also form factor. Fujifilm wants to have a presence at the 2020 Olympics, but they mention video is just as important as photography at the event. They want to support photographers and videographers and broadcasters. The Fujifilm GFX100Mpx is almost final hardware, but the firmware is still very early and IBIS isn’t even working yet. The GFX100Mpx has the same kind of sensor design as the X-T3 with copper wiring that makes for higher readout speeds and lower power consumption. The Fujifilm X-T30 already has the improved AF software that will be coming to the X-T3 soon. 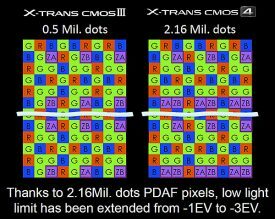 Picking horizontal or vertical PDAF pixels is easiest with CMOS sensors, but vertical are used the most so it is pretty much the standard with mirrorless cameras. The resolution of the vertical PDAF is good enough that you don’t really need cross type, plus you can just tilt the camera a little and it will track like a cross type if necessary. 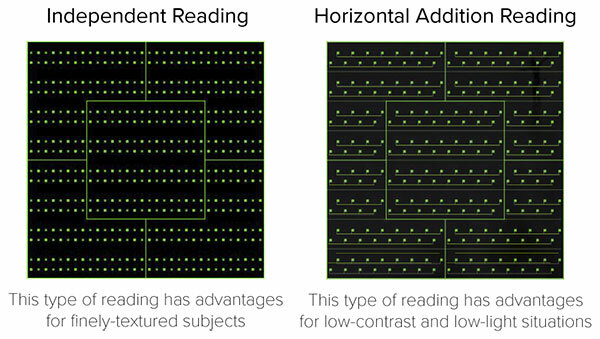 Fujifilm’s latest on-sensor phase-detect system is unusually flexible, containing both very closely-spaced focus pixels as well as one spaced further apart. 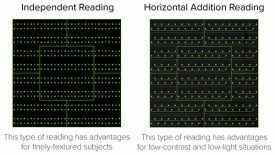 Their AF system uses all the AF pixels to perform phase-detect calculations for six different spatial frequencies simultaneously, so it can handle both extremely fine detail as well as low-contrast and low-light subjects. 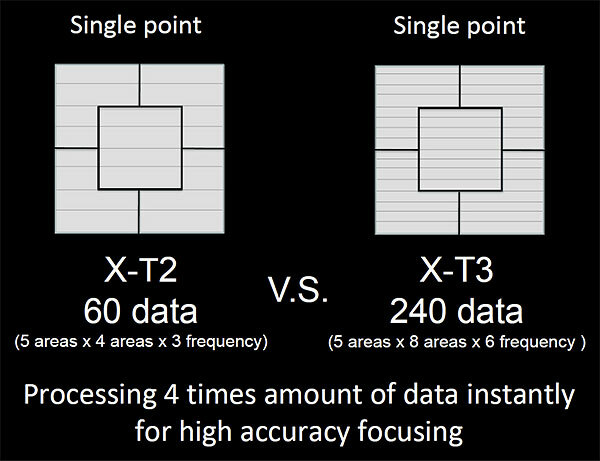 The X-T3’s on-chip phase-detect AF system increased the amount of AF information by a factor of four over their previous technology. 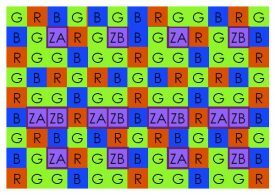 There are twice as many focus pixels, and it now performs the PDAF calculations for six vs three different spatial frequencies. 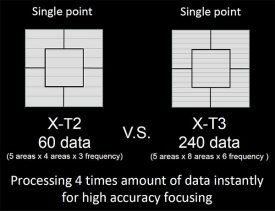 Besides now looking at six different spatial frequencies vs three, the sensor in the X-T3 can also “bin” or combine data from focus pixels on each row, significantly improving low-light performance. 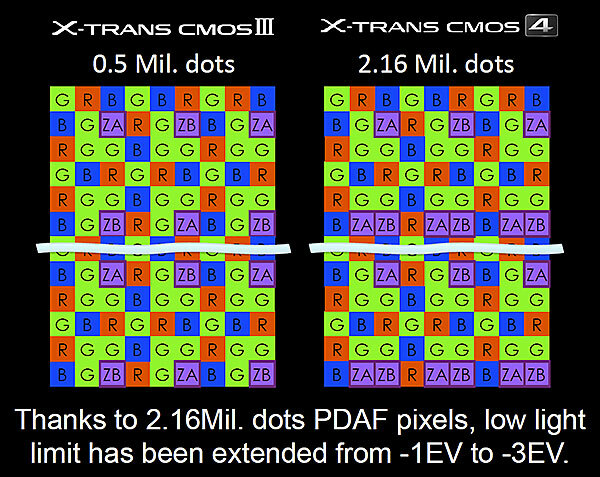 Phase-detection autofocus pixel and RGB color filter array layout of an X-Trans CMOS 4 image sensor. 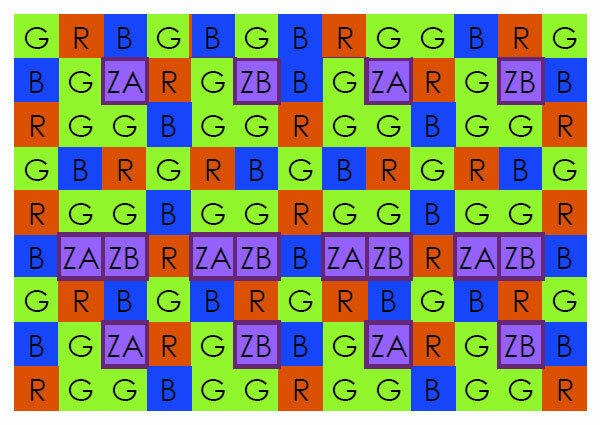 The ZA and ZB pixels shown each form one half of a phase-detection AF pair. Their AF is basically limited by their algorithm and processing power, but right now it’s more limited by processing power. Fujifilm designs their lenses to have a super sharp point when focusing and not to just have a generally sharp area like others, which is one of the advantages of mirrorless. This entry was posted in Fujifilm GFX, Fujifilm GFX 100 Megapixel, Fujifilm GFX 100S, Fujifilm GFX 50R, Fujifilm GFX 50S, Fujifilm X-T3, Fujifilm X-T30, Interview and tagged Fuji GFX, Fuji GFX 100, Fuji GFX 100M, Fuji GFX 100R, Fuji GFX 100S, Fuji GFX 50R, Fuji GFX 50S, Fuji GFX100, Fuji GFX100M, Fuji GFX100R, Fuji GFX100S, Fuji GFX50R, Fuji GFX50S, Fuji Rumors, Fuji X-E4, Fuji X-H1, Fuji X-H2, Fuji X-Pro3, Fuji X-T2, Fuji X-T3, Fuji X-T30, Fuji X-T4, Fuji X-T4Pro, Fuji X-TPro, Fuji X100, Fuji X100IV, Fuji X200, Fuji XE4, Fuji XH1, Fuji XH2, Fuji XPro3, Fuji XT2, Fuji XT3, Fuji XT30, Fuji XT4, Fuji XTPro, Fujifilm, Fujifilm FinePix XP130, Fujifilm GF 100-200mm f/5.6 R LM OIS WR, Fujifilm GF 100-200mm f/5.6 RLM OIS WR, Fujifilm GF 45-100mm f/4 R LM OIS WR, Fujifilm GF 50mm f/3.5 LM WR, Fujifilm GF 80mm f/1.4 R LM WR, Fujifilm GF50mm f/3.5 LM WR, Fujifilm GF80mm f/1.4 R LM WR, Fujifilm GFX, Fujifilm GFX 100, Fujifilm GFX 100M, Fujifilm GFX 100Mpx, Fujifilm GFX 100R, Fujifilm GFX 100S, Fujifilm GFX 50R, Fujifilm GFX 50S, Fujifilm GFX100, Fujifilm GFX100M, Fujifilm GFX100Mpx, Fujifilm GFX100R, Fujifilm GFX100S, Fujifilm GFX50R, Fujifilm GFX50S, Fujifilm Rumors, Fujifilm X-E4, Fujifilm X-H1, Fujifilm X-H2, Fujifilm X-Pro3, Fujifilm X-T2, Fujifilm X-T3, Fujifilm X-T30, Fujifilm X-T3Pro, Fujifilm X-T4, Fujifilm X-TPro, Fujifilm X100, Fujifilm X100IV, Fujifilm X200, Fujifilm XE4, Fujifilm XF 16-55mm f/2.8 R LM WR, Fujifilm XF16-55mm f/2.8 R LM WR, Fujifilm XF8-16mm F2.8 R LM WR, Fujifilm XH1, Fujifilm XH2, Fujifilm XPro3, Fujifilm XT2, Fujifilm XT3, Fujifilm XT30, Fujifilm XT4, Fujifilm XTPro, FujifilmRumors, Fujinon GF 100-200mm f/5.6 R LM OIS WR, Fujinon GF 100-200mm f/5.6 RLM OIS WR, Fujinon GF 45-100mm, Fujinon GF 45-100mm f/4 R LM OIS WR, Fujinon GF 50mm f/3.5 LM WR, Fujinon GF 80mm F/1.4 R LM WR, Fujinon GF100-200mm, Fujinon GF50mm, Fujinon GF50mm f/3.5 LM WR, Fujinon GF80mm f/1.4 R LM WR, Fujinon MK, Fujinon MK18-55 T2.9 Cine, Fujinon MK18-55 T2.9 Cine Lens, Fujinon MK18-55mm T2.9, Fujinon MK50-135mm T2.9, FUJINON MKX18-55 T2.9, FUJINON MKX50-135 T2.9, Fujinon XF 16-55mm f/2.8 R LM WR, Fujinon XF 16-80mm f/4, Fujinon XF 16-80mm f/4 R LM OIS WR, Fujinon XF 16-80mm f/4 R OIS WR, Fujinon XF 16mm, Fujinon XF 16mm f/2.8, Fujinon XF 16mm f/2.8 R WR, Fujinon XF 16mm F1.4 R WR, Fujinon XF 33mm, Fujinon XF 33mm f/1, Fujinon XF 33mm f/1 R WR, Fujinon XF 33mm F1.0 R LM WR, Fujinon XF 8-16mm F2.8 R LM WR, Fujinon XF16-55mm f/2.8 R LM WR, Fujinon XF16-80mm f/4, Fujinon XF16-80mm f/4 R LM OIS WR, Fujinon XF16-80mm f/4 R OIS WR, Fujinon XF16mm f/2.8, Fujinon XF16mm f/2.8 R WR, Fujinon XF16mm F1.4 R WR, Fujinon XF33mm, Fujinon XF33mm f/1, Fujinon XF33mm f/1 R WR, Fujinon XF33mm F1.0 R LM WR, Fujinon XF8-16mm, Fujinon XF8-16mm F2.8, Fujinon XF8-16mm F2.8 R LM WR, Fujinon ​XF 33mm f/1, Fujinon ​XF 33mm f/1 R WR, Fujinon ​XF33mm f/1, Fujinon ​XF33mm f/1 R WR, Fujinon GF45-100mm F4 R LM OIS WR, Fujinon GF50mmF3.5 R LM WR, Fujirumors, GF 1.4 TC, GF 1.4x Teleconverter, GF 100-200mm f/5.6 R LM OIS WR, GF 100-200mm f/5.6 RLM OIS WR, GF 45-100mm f/4 R LM OIS WR, GF 50mm f/3.5 LM WR, GF 50mm f/3.5 LM WR GFX, GFX, GFX 100, GFX 100M, GFX 100R, GFX 100S, GFX 50R, GFX 50S, GFX100, GFX100M, GFX100R, GFX100S, GFX50R, GFX50S, Medium Format, Super Full Frame, X-H1, X-H2, X-T2, X-T3, X-T4, XH1, XH2, XT2, XT3, XT4. Bookmark the permalink. Trackbacks are closed, but you can post a comment.